This is a pretty good cereal, but it's barely a "chocolate cereal" as compared to other chocolate cereals on the market. Don't expect a lot of chocolate milk at the bottom of your bowl. The chocolate is considerably subdued and, surprisingly, it's the subtlety of the new flavor that makes this cereal special. The flavor here is Rice Chex and Corn Chex with just a touch of chocolate. It's has a mellow sweetness that's far more adult than, say, Cocoa Krispies or Cocoa Puffs. If you're looking for a kid-like chocolate fix, this probably isn't the cereal for you. Nutritionally, Chocolate Chex isn't particularly healthy or unhealthy. It has only 8 grams of sugar per serving which is respectable for a cereal with chocolate in the name. 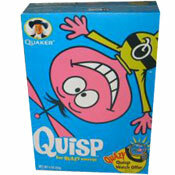 On the other hand, it has less than 1 gram of fiber which is low even when compared to cereals geared toward children. Incredibly, this cereal contains .5 grams of saturated fat. That number might seem low, but in a market sector that's led the way in getting rid of saturated fats, it very rare to see any number but 0 in a new cereal marketed toward adults. Additional nutritional information per 3/4 cup serving: 130 calories, 25 calories from fat, 2.5 total grams of fat, and 2 grams of protein. If you like Chex cereals and you like chocolate, you'll probably like this new cereal. If you're looking for a chocolate fix or truly healthy cereal with a fun flavor, keep shopping. 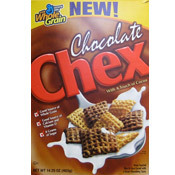 What do you think of Chocolate Chex? I'm in love with Chocolate Chex. It's literally the only thing I eat every day. I've never been a big fan of cereal until I tried this. Now I can't be without it. I love Chocolate Chex but feel the name is misleading. The Vanilla Chex have no flavor and it appears to be a 50/50 ratio. I don't buy other brands that state chocolate or cocoa and get half a handful of vanilla when I am snacking on them. I want Chocolate Chex - not a mix. Almost as dynamite as Cinnamon Chex (but not quite). I first saw this cereal 6 years ago. Fell in love with it immediately. Then it vanished (kidnapped perhaps by some people who hate chocoholics perhaps?). Then 2 months ago, I saw her! She was back in my life and unchanged in flavor. I love my chocolate (I've been known to eat Quik powder), but the chocolate flavor is perfect. General Mills, please NEVER alter the recipe! Rice Chex are my over all favorite breakfast cereal, so I was glad to see another flavor to try. They're great! The chocolate is definitely there and it's not overpowering or too sweet! Just enough. I was addicted to it, especially since I'm allergic to gluten and Choc Chex are gluten free. Now they don't sell it in Northern VA! But it's still advertised on the Cinnamon Chex box. Whassup?? I can't find this cereal anymore!! I loved it. What gives?? I found this in Nashville for a few months, now, it has disappeared. What gives? Where can I get it? I can't get enough of this stuff! It is definitely my new favorite breakfast cereal!